Can Nonprofits Support the Rebuilding of the Nation’s Crumbling Infrastructure? The future of a rusting New Hampshire pedestrian bridge is now less certain because the nonprofit founded to maintain it is closing due to declining membership. The Chesterfield Arch Bridge Beautification & Preservation Society was founded in 2009 to preserve and improve the rare steel bridge. The nonprofit got off to a strong start, enlisting 40 members, building benches, and launching a formal dedication of the bridge to Justice Harlan Fiske Stone a year later, according to a Keene Sentinel story. But in a cash-strapped state with more than 8,000 nonprofits, the Society’s membership has dwindled to just six people after others left frustrated at the NH Department of Transportation’s inability to pitch and help. It’s clear that the country’s transportation infrastructure is at a tipping point. The bridge is one of thousands that are lacking investment; the American Society for Civil Engineers’ most recent report card graded the country’s bridges a C+ and its roads a D. Overall, the report estimated an investment of $3.6 trillion is needed by 2020 to correct the U.S.’s infrastructure problems. The issue of infrastructure—what to do and how much to spend—came up for debate during the recent presidential election, with President-elect Donald Trump touting his commitment to “transform America’s crumbling infrastructure into a golden opportunity for accelerated economic growth and more rapid productivity gains with a deficit-neutral plan targeting substantial new infrastructure investments,” according to his website, although no specific numbers were cited. Trump recently announced that he would name real-estate developers Richard LeFrak and Steven Roth to lead a council on his infrastructure plan, according to the Wall Street Journal. The seemingly bipartisan issue has been given a new spin by Trump, however, who has emphasized private financing and claims that construction costs tend to be higher and take longer when the government builds projects instead of the private sector, according to The Hill. The proposal would offer $137 billion in federal tax credits to private investors who want to back transportation projects, which the blueprint says would unleash up to $1 trillion worth of infrastructure investment over 10 years. Historically, the country’s infrastructure is financed through state and local governments using a mix of their own revenues, federal highway aid and issued bonds. Critics of Trump’s private financing plan, however, say that private investors would only fund projects that have tolls or user fees that can recoup investment costs. Therefore, critical infrastructure needs like repairing aging pipes, deepening ports or fixing existing roads and bridges without tolls may go neglected under Trump’s plan. So, that potentially leaves many bridges, like in Chesterfield, without increased funding for repairs. 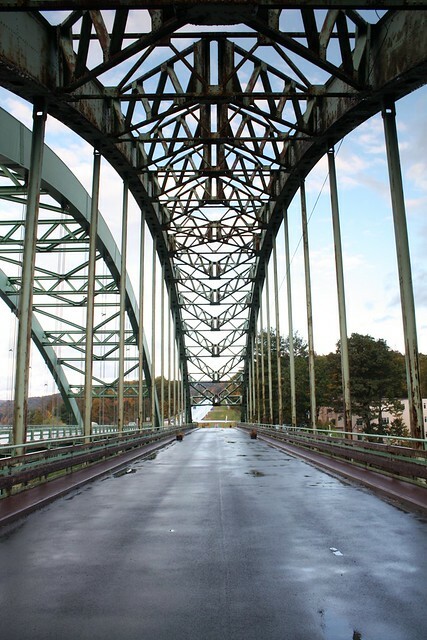 According to the Keene Sentinel, the nonprofit organization founded to preserve the bridge expected to eventually receive state help with maintenance of the rusting and rotting arches and railings, although the state doesn’t make maintenance of bypass bridges a top priority. Correction: This article has been changed from its initial release. The amount of money needed by 2020 according to ACSE is $3.6 trillion.